Are you or your loved one safe at home? Can you take care of yourself or another safely? Are you at risk for falls? Are you missing meals or medication? 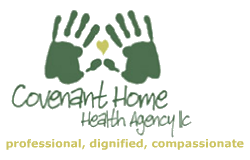 Covenant Home Health Agency can provide evaluations for people concerned about the safety and well-being of those living at home. The environment, the medical needs, the strength and physical capabilities of the caregiver and the cognitive abilities of those in the home are just a few of the criteria that are examined when determining if a patient will be safe and well cared for at home. We are pleased to consult with you and other health care professionals to develop a plan of care that provides for maximum comfort and safety.